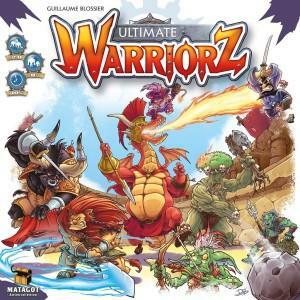 We review the family friendly arena game Ultimate Warriorz, from Asmodee Games. 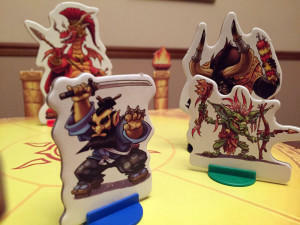 In this easy to learn game, players control a monster in an arena battle and fight it out for glory. Ultimate Warriorz is a reimplementation of 2009’s Mad Arena. The object of the game is to be the last warrior standing. If more than one warrior is alive after seven rounds, then the warrior with the most popularity will be declared the winner. The artwork is fantastic and fits with the theme of the game perfectly. I was very happy with Ultimate Warriorz’ components. 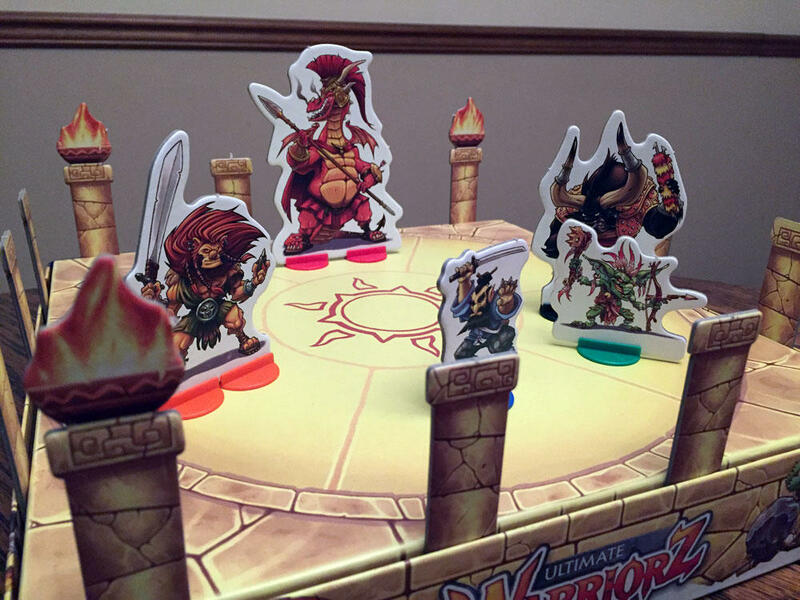 The game includes eight unique warriors, each with its own cardstock standee (the cardstock is nice and thick), Warrior card (displays the character’s name, starting defense, and starting health and size), eight Action cards (six regular actions and two unique Special Actions) and Lucky Charm. I really liked the art on these components. Each Warrior was given a unique personality that was brilliantly captured by these illustrations, especially on the Action cards. Also unique to the game is the arena itself. The game comes packaged with a sheet on the bottom of the box that is the usual pictures and explanation of a game for a perspective buyer to peruse. Once purchased, you remove the sheet and the bottom of the box is the arena. Simply take the components out of the box, place the bottom of the box inside the top of the box, add the four sets of columns, and voila, your arena board is ready! The remaining components, such as the dice, counters for life/popularity points, and clear bases for the standees are par for the course. Each card has different values for movement, melee, ranged attacks, and defense. 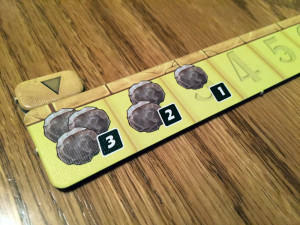 Each player selects one of their unused action cards. Because there are eight cards but only seven rounds, one of the action cards will not be used during the game. Each card has an initiative value, numbered sequentially from one through eight, and also includes the number of movement points, number of dice to be rolled in melee combat, number of dice to be rolled for ranged combat, and a special ability, if applicable. After every player has selected a card, a countdown from eight to one is announced. When the number matching a player’s initiative value is called out, their card is flipped and the action is taken. If multiple players play cards with the same initiative value, the character with the smaller size goes first (Note: size is tied to starting health; the bigger the Warrior, the more starting health and size they have, but the slower they are). The active player places their Action card on top of their previously played action card. This is important because the defense on the Action card played is now that warrior’s defense until their next Action card is played. The warrior then must perform all of the actions on the Action card; remember that not every card includes movement, melee, and ranged actions. Movement can be interrupted to engage an enemy in a melee attack (target and warrior must both be in the same space) or a ranged attack (target must be one zone away from the warrior; if the target is two zones away, each die rolled is at a -1 penalty). All movement must be used and the warrior cannot end in the same space in which he started. 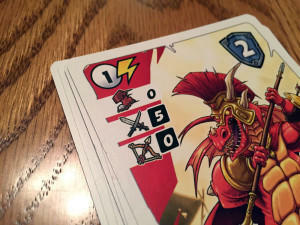 The warrior rolls the number dice indicated on the Action card and compares the result to the target’s current defense. Every hit earns the warrior one of the life tokens from the target. These tokens represent popularity points that determine the true winner if multiple warriors survive all seven rounds. NOTE: The first time a target takes damage in a game, its first life token is worth 3 popularity points. If a target runs out of life, the standee is immediately removed from the arena and given to the warrior that eliminated the target. The round marker is moved to the next round, unless it is the seventh round. If multiple warriors are alive after the seventh round, the one with the most popularity points is declared the victor, with the number of eliminated standees breaking ties if warriors have the same popularity. The box cleverly flips upside down to form the arena, complete with side pillars. However, this was not an issue with this game. The single, most important subject that I need to discuss is that ganging up/picking on/griefing one player is handled BRILLIANTLY in Ultimate Warriorz. 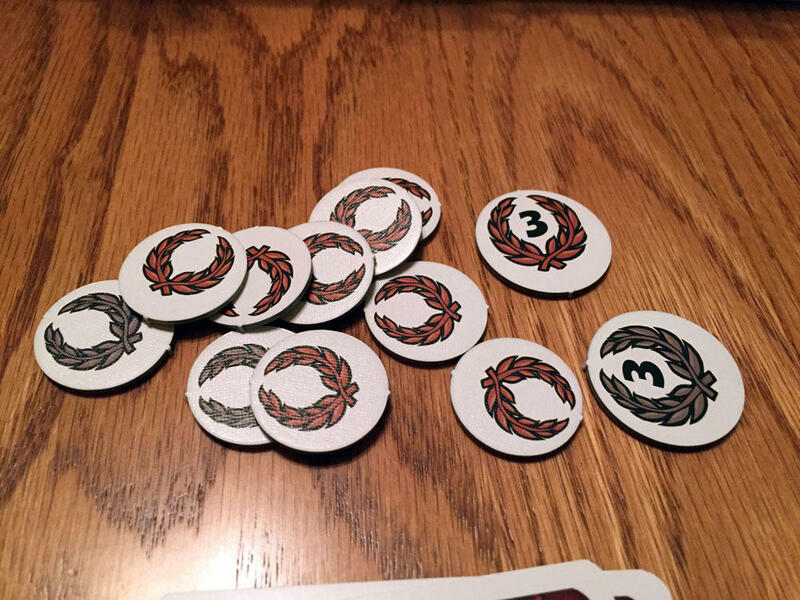 The first token a player collects is worth triple the victory points. The main way this is built into the game is the first time any warrior is hit, the first life point lost is worth three points instead of one. This insures that, especially at the start of the game, everyone is specifically trying to target someone who has not been hit. This is an amazingly simple way to encourage beating everyone up instead of eliminating a single player immediately. The second way this is handled is by making a player’s health also be his popularity points. If I have an attack that rolls three dice, I am not going to go after someone with one health. It is almost always better to attack someone whose health is greater than the number of dice you are rolling as it maximizes your points. The game has a built in mechanism to discourage knocking out a player in the first three rounds. I also thoroughly enjoyed the decision about what card to play each round. There are many variables to consider: your position on the board (there are only seven spaces, six outside spaces and one center space), which cards you have already played, which cards your opponents have remaining, your opponents’ current health and, most importantly, when you think you will activate based on the initiative of the card you play and, potentially, the size of your character as this breaks ties. 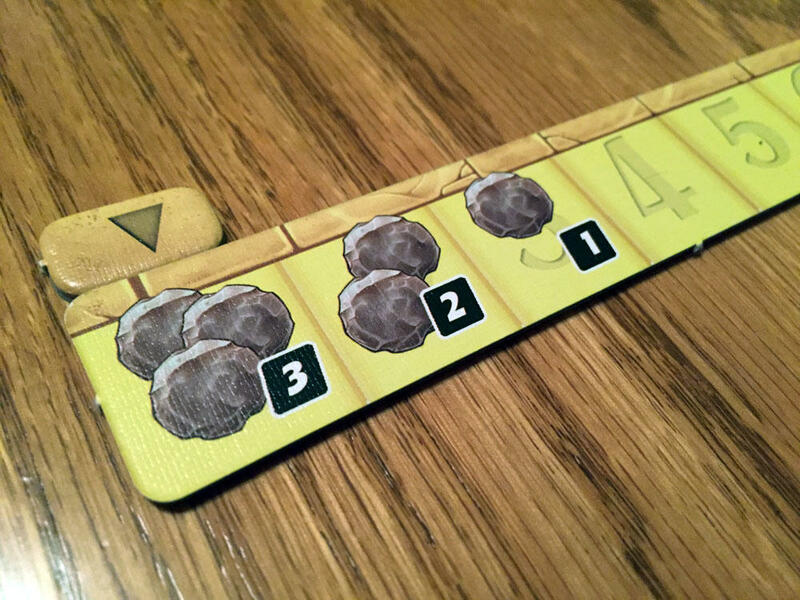 For an easy game to teach and learn, this can be an agonizing choice to make. I enjoy games with action programming. What is enjoyable about this game is the simplicity of the action programming. 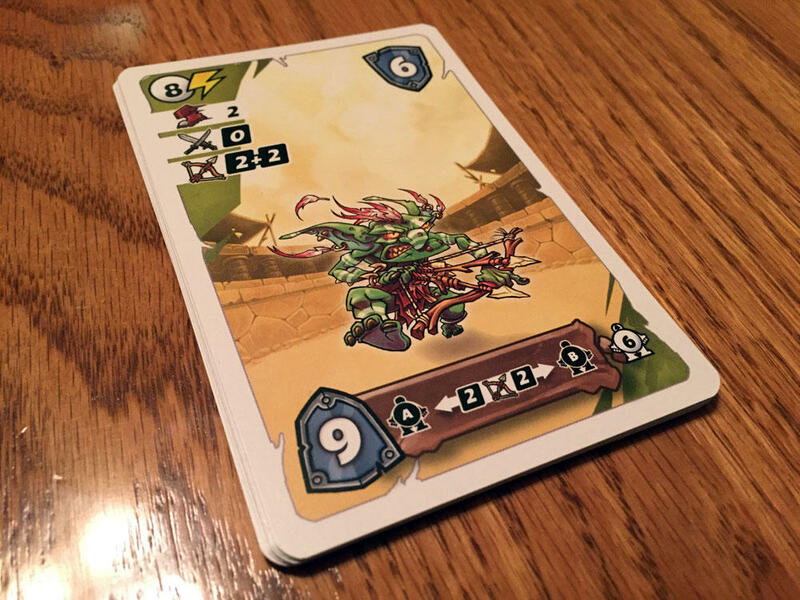 You have the tension of when will your warrior get to move or, worse, if you picked a card that rolls many melee dice but does NOT allow you to move, will the target who is currently in your space move before you get to attack?! What the game avoids is the frustration of programming your actual moves. All that it determines is when you go while still allowing the player the decision of how to handle the actions allowed on their turn. The only weakness I found with the game, and it is minor, is that both the two and three player games are less than satisfactory. The arena isn’t as cluttered and the initiative phase is not as dramatic. There is a team variant where players can manage multiple warriors, but this complicates one of the game’s most important qualities – its simplicity. Each character plays the game a little differently. Smaller characters have less health, but are much harder to hit. I really enjoyed my time with Ultimate Warriorz, even if it is a family-friendly game. It plays quickly and the decisions, while sometimes difficult, are fun to make. Watching the initiative countdown unfold can also be very entertaining. 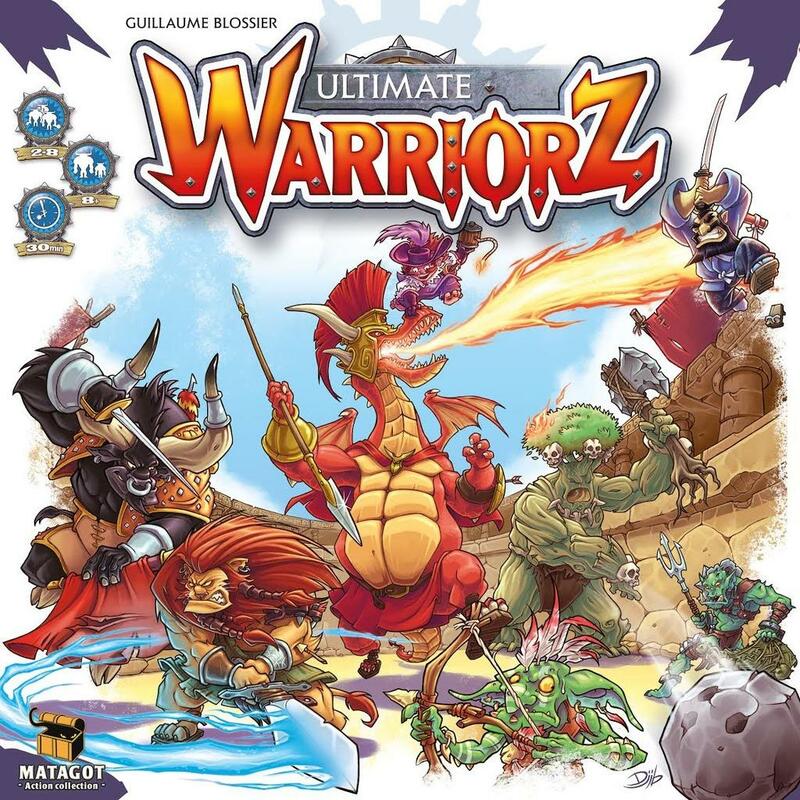 I highly recommend Ultimate Warriorz as a filler for serious groups and for families, especially if you want to introduce your kids to a more confrontational game. The barriers to prevent picking on one player are awesome! If you’d like to pick up a copy of Ultimate Warriorz, you can get it for about $30. Final Score: 4 Stars – A family friendly arena game that has enough enjoyment to entice a group of gamers to have some fun with it. Brian’s love of boardgames was revitalized when he discovered Puerto Rico in 2005. He now enjoys playing worker placement, deck building, dice driven and coop games with his primary gaming partner, his wife.